Your day cannot end badly after a ride in a tuk tuk, on the contrary! Discover the Maas en Waal area in a unique way: with a tuk tuk ride. A fun activity for all ages. Experience the Land van Maas en Waal area with this unique means of transport. Lovely ride through farm roads and dikes with a tuk tuk. A tuk tuk is suitable for 7 people and because it’s electric, also very easy to operate. Tuk tuk ride on the beautiful dikes of the Gelderse Rivierenland area . You will receive a route map and various tips for nice stops on the way. Every turn brings something new. Meandering dikes, deserted islets and picturesque outdoor polders. Driving in a tuk tuk is a nice activity for all ages! Enjoy the complete tuk tuk package including an indoor activity and indoor Dutch-style Gourmetten table grills.. Complete your experience with the tuk tuk arrangement. A nice afternoon out for everyone. 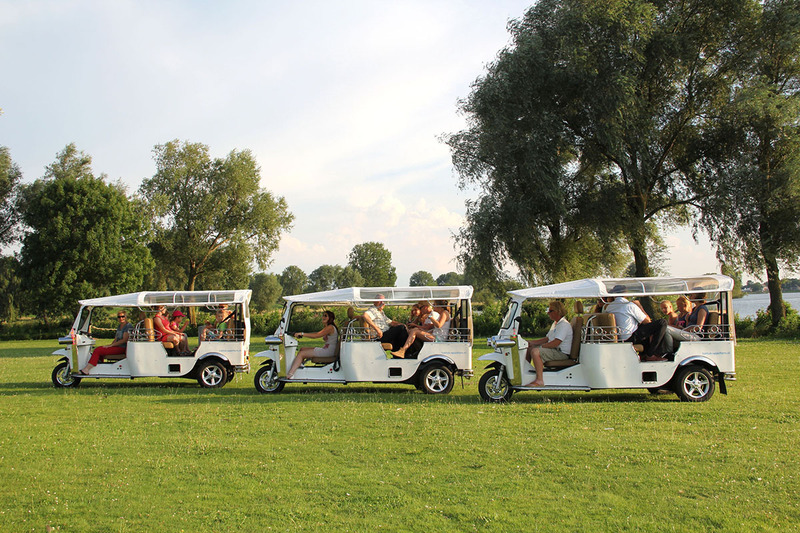 Discover the Land of Maas en Waal area in a tuk tuk and afterwards get started with an an active indoor activity. The arrangement continues with delicious indoor Dutch-style Gourmetten table grills. Round it all up by grabbing some drinks with the people you are bringing with you. A unique experience. Ride around in an electric tuk tuk. Would you prefer a complete program? Riverside Outdoor & Events provides the tuk tuk rental. Dive into the water like a dolphin or fly over the water like a superhero. Flyboarding is suitable for young and old and gives a great adrenalin kick! Come enjoy minigolf on Moeke Mooren's 18-hole course. An exciting challenge for young and old. Come and have fun with family or friends in retro style with disco lights and cheerful music, making bowling a real party! Rent an electric boat for a day and float on the Maas river and the ponds of the beautiful recreation and nature reserve De Gouden Ham.